College football season has unfortunately passed us by, but for the first time in 5 seasons, I have another football season to cheer for. The NFL playoffs are in full swing and THE CAROLINA PANTHERS ARE IN THE PLAYOFF MIX! Living in Charlotte, Sally and I have become huge Carolina Panthers fans. The franchise has had its ups and downs, but this year’s team is a contender. After a 12-4 NFC South Championship regular season, the Panthers earned a 1st round bye and are only 2 wins away from the Super Bowl! On Sunday, the Panthers will host the San Francisco 49ers. 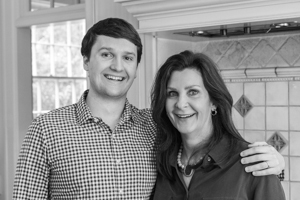 For this big game, The Charlotte Observer asked Sally and me to come up with a 3 recipes for a playoff inspired menu. Our menu is designed for the home tailgater. 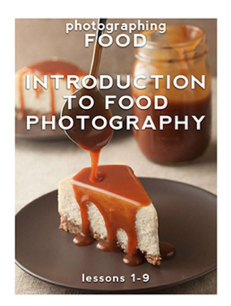 The menu centers around an appetizer, main dish, and a dessert. First up, the appetizer. 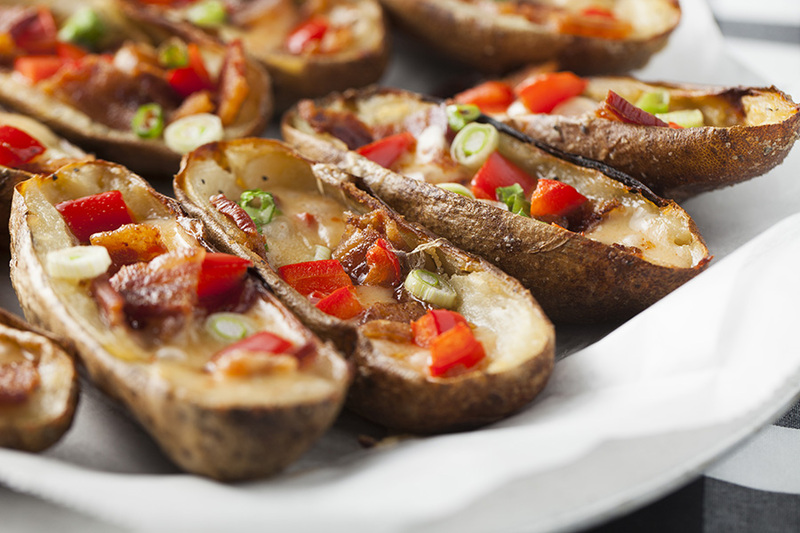 These Bacon Chipotle Gouda Potato Skins are the perfect appetizer to set out before the game. They are inspired by the 49ers colors, so you can take a bite out of the competition before kickoff. 1. Preheat the oven to 400 degrees. Wash and dry the potatoes. Pierce each potato several times with a fork. Bake potatoes for 45 to 55 minutes until they are done and the skins “give” when pressed with the back of a fork. Remove the potatoes from the oven. Cool on the pan for 15 minutes. Keep oven on. 2. Slice each potato lengthwise. Scoop out the flesh of the potato with a spoon leaving about 1/4 inch of potato on each skin. Place each potato cut side up on a baking sheet lined with parchment paper or a silicone pan liner. Set aside. 3. In a small saucepan melt the butter over medium heat. Stir in the salt and pepper. Remove the butter from the heat. With a pastry brush, baste each potato half with the butter mixture. Place on baking pan and bake at 400 degrees for 5 to 7 minutes until butter bubbles. Remove from oven and flip potato skins over. Baste the skin side with butter. Put the skins back in the oven and bake for 5 to 7 minutes until the butter bubbles. Remove the skins from the oven. Skins may be cooled to room temperature and refrigerated overnight at this point. Bring skins back to room temperature before filling and baking. 4. To finish the potato skins, cut the bacon and chipotle Gouda into bite sized pieces. Divide the bacon and cheese pieces equally between the potato skins. Top the skins with red bell pepper. Sprinkle the skins with scallions. Bake the skins at 400 degrees for 5 to 10 minutes until the cheese melts. 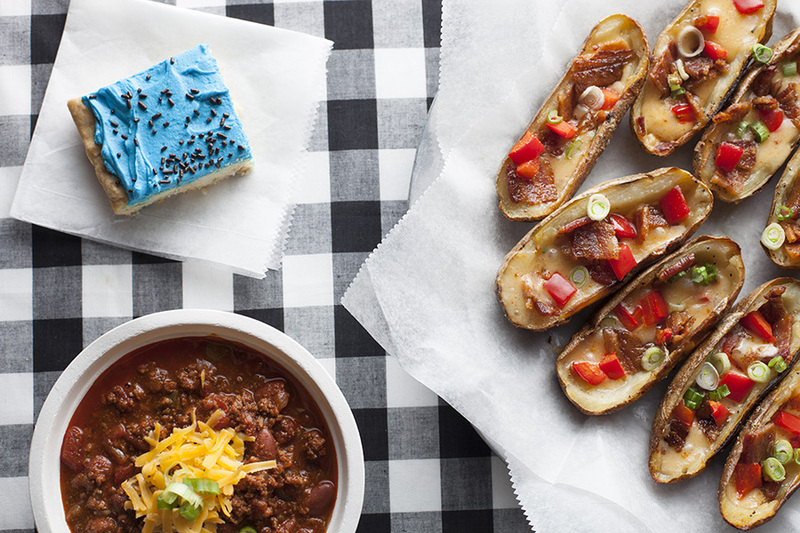 Serve potato skins warm or at room temperature. For the main meal, a chili bar is a great choice! You can make this Couch-Gate Chili the night before, refrigerate, and then keep warm in a slow cooker throughout the game. 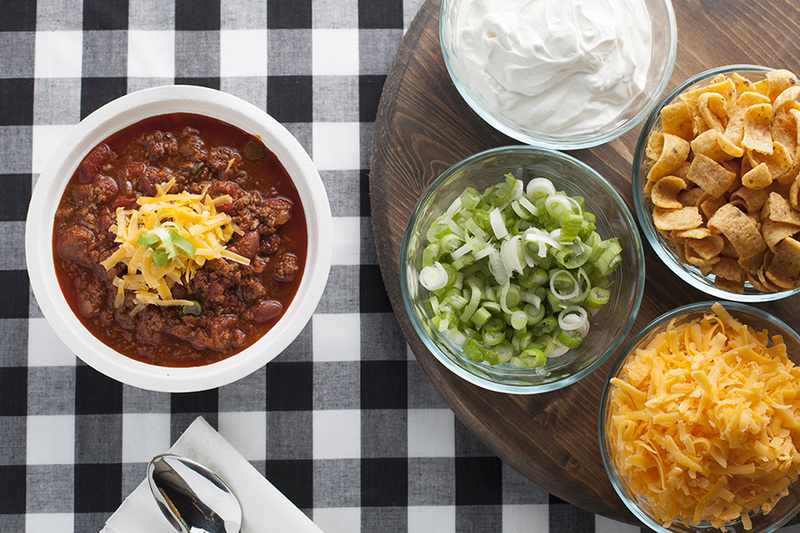 When serving, create a chili bar where guests can customize to suit their specific tastes. Sally and I like to offer shredded cheese, sour cream, corn chips, sliced scallions, and hot sauce at our chili bar. 1. In a large pot add the olive oil, onions, peppers and garlic. Cook over medium heat for 5 to 7 minutes, stirring frequently, until the onions are translucent and the peppers are soft. Add the chili powder, cumin, salt, oregano, pepper, thyme and cayenne. Cook for 3 minutes, stirring frequently. Add the ground sirloin and cook over medium heat for 10 minutes, stirring frequently. 2. Add the tomatoes with chilies, diced tomatoes, tomato paste and chicken stock. Stir until well-mixed. Add the kidney beans and Worcestershire sauce. Reduce the heat to a simmer and cook the chili for 1 1/2 to 2 hours, stirring occasionally. Add Tabasco sauce to taste. 3. Keep the Chili on low heat until ready to serve or chill in the refrigerator and reheat on the stove or crockpot the next day. * To make a milder chili reduce the amount of the jalapeno peppers. To amplify the heat, include the seeds and membranes of the jalapeno pepper. 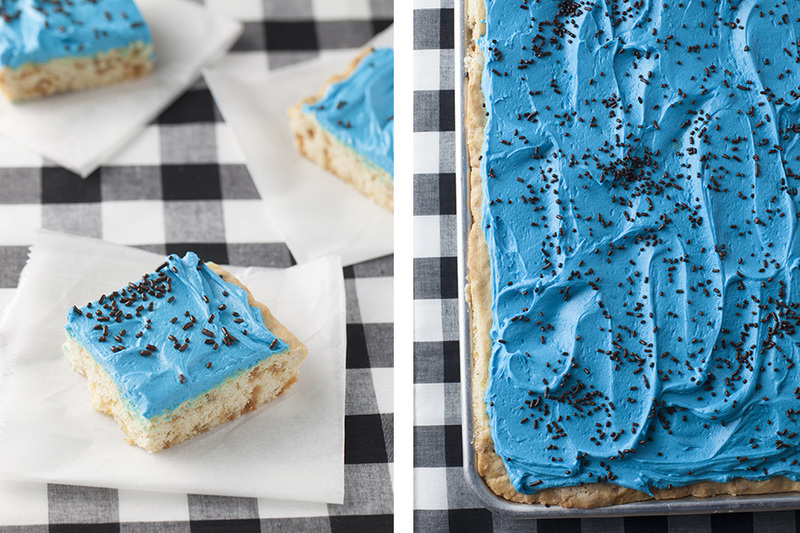 For dessert, we decided to show our team spirit with a Carolina Panther Blue Sheet Cake Sugar Cookie! In order to steal the 49ers gold, we added bits of heath bar to it! You can serve the cookie in the pan and allow guests to cut a piece that will suit their appetite! 1. Preheat the oven to 350 degrees. Butter the sheet pan and set aside. To make the sugar cookie base put 2 sticks of butter into a mixer bowl. Cream the butter until it is light and fluffy. Add the sugar and beat on medium speed until the mixture is well blended. Add the eggs, one at a time, mixing well after each addition. Add the vanilla and lemon juice and mix to blend. Put the flour, salt, soda and toffee bits in a separate bowl. Stir until the flour mixture is well blended. 2. Add the flour mixture to the butter mixture and mix on low speed until the dough is just blended. Empty the sugar cookie dough onto the prepared sheet pan. Use your fingers to spread dough evenly over the bottom of the pan. The dough will be sticky. Wetting your fingertips makes the dough easier to handle. Bake the cookie for 25 minutes, rotating the pan after the cookie has been baking 15 minutes. Remove the cookie from the oven and let cool in the pan on a wire rack. 3. While the cookie is cooling, make the frosting. Put 2 sticks of butter and the cream cheese into the work bowl of a mixer. Mix on medium speed until the butter and cream cheese are well blended. Add the salt, vanilla and lemon juice. Mix until blended. Add the confectioners sugar. Mix on low speed until the sugar is incorporated. Beat the frosting on medium high until it is fluffy. Add food coloring, if desired, and mix on medium speed until blended. Frost the cooled cookie. Serve. Good luck to the Panthers this weekend! Will you be watching the NFL playoffs this weekend? What team are you cheering for? For the full article and tips for tailgating at home click here.